Leftovers never looked so good. 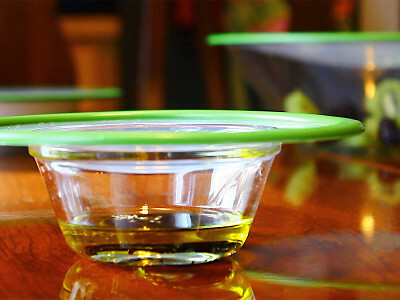 With EZ Seal reusable silicone lids, you can create an airtight seal on any bowl, container or pot. The see-through covers make it easy to identify what’s inside your containers, and they eliminate having to fuss with unwieldy plastic wrap or aluminum foil. With EZ Seal lids, you can store and reheat leftovers in the same dish you used to prepare a meal. The silicone lids also make it convenient to prep a recipe ahead of time and store it in the same container you intend to use for serving. The creator of EZ Seal is Silicone Zone, an innovative product design company that uses modern forms and advanced materials to solve everyday kitchen conundrums. Their EZ Seal covers are designed to work like suction cups to create vacuum seals with superior spillage protection. Simply place one on top of a bowl or pot—they fit most glass or metal containers—and firmly press the center to lock the lid in place. EZ Seals are safe for the microwave, refrigerator and freezer, and the covers store flat so they won’t clutter your kitchen cabinets. The appeal is airtight. 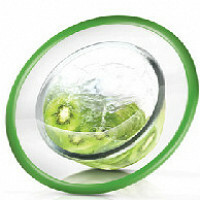 Hello Everyone, I am Robert Meeker, the US Product Manager for Silicone Zone. But more than that, I am a down to Earth everyday consumer always on the look out for something new, cool, and most of all something that actually works. The EZ Seal from Silicone Zone is one of those products. At your first look of the EZ Seal in action you will wonder how it works and how no one has thought simple design decades before? With a simple combinations of ingenuity and the highest quality silicone available, Japanese grade, the EZ Seal came into existence. Two simple steps are all you need, Place it over a bowl or other round container and Press down on the center and you have an air-tight seal ready for storing food. The EZ Seal can also go in the fridge, freezer, microwave, and dishwasher for easy clean up and time and time again uses. So if you have any questions please ask away! I do plan on ordering this amazing product despite the very irritating vocal fry exhibited by the narrator in the video. So annoying!! @ Caroline What is vocal fry? I thought the audio was fine. On another note I have a friend who bought these and they do work. @ Alice It's a vocal affectation that many young women seem to be using nowadays that sounds like a creaky door when they are ending their sentences. Not only annoying to listen to, but also not good for the voice! how sweet of you Caroline! I actually think the narrator is lovely and did a very nice job of explaining the lids. Hope your day continues in a more positive way. Enjoy! @ Caroline ...rude comment ...I don't think this girl is "affecting" anything, it just sounds like her normal voice. She's in a rather low register and some people are just like that ...you sound nitpicky. Do they really work ? Hi MJ, working with this product I will say that it does what it says it'll do. The lid creates a tight seal best when it's clean and the bowl opening completely covered. What are the sizes of the three seals in the set? You can always find this type of information in the "details" tab next to the "story" tab. Please see dimensions below. Will these work on square or other shaped containers? Yes, these will work on other shapes as long as the seal is larger than the container. If it's a small square or circle, the EZ seal will take up more space than needs however, so just pay attention to the size of the container. do they work on only glass and metal? These seals will work on any material that will allow the seal to provide a suction, so it needs some friction. Glass, metal and plastic will likely work best. While they can withstand high temperatures, it's recommended and easiest to simply wipe them down with a towel instead of having them take up space in your dishwasher. In most cases it would be easier to wash by hand, but they are dishwasher safe! Do they work on bowls made of plastic or wood, etc. Someone had a similar question above. They will work on any material that can provide a suction. We didn't test on wood in the office, however wood won't likely have as good of a suction power as glass or metal. Are they 100% silicone. Do they contain any plastics? It's 100% silicone on the lid so no added plastics The rim is made of nylon. I saw these same lids at a kitchen shop in Texas for $10 each. What's with the $22 each? @ Glorie Sonnier It is set of 3 for $22..........seems about right? The price is actually $22 for the set of 3, not per each. I am very interested as to where and what you saw. Was it the EZ Seal from Silicone Zone? Was it sold in a pack of 3 different sizes? Please keep in mind that Silicone Zone uses only the highest quality silicone. It is a Japanese grade which has a higher rating than European grade and then even grater than USA grade. This can cause our pricing to be a little bit higher, but you are paying for quality, product life span, and a much safer quality silicone than other cheaper imitations. I'm assuming that they sort of peel off - is that ever a problem? Completely understandable question. This is one of those products that is best presented and demoed in person so you can play around with it first hand. The EZ Seal does just peel off like a normal suction cup would, only it has an edge to make it more durable and reliable. Does the EZ seal work on plastic containers? All of the examples in the video were glass and metal. The EZ Seal does work on plastic containers. Just keep in mind the more smooth the edge of the surface of the container, the better it works. Just like a regular suction cup. Great idea! I hope you'll humor a few questions I thought of: Will finger nails puncture or damage the silicone over time? Will it work to press down with your knuckle in that case? Also, what kind of life span can be expected from normal daily kitchen use? And last, can you stack things on top of it, like to use upward space when storing things in a fridge? I'm sure Robert will chime in shortly with some good answers here, but wanted to relay some information that I have. While it is highly durable, we wouldn't recommend using long or sharp fingernails to press down. We've actually been using our fingers, knuckles and even hands here. Yes you can store things on top of it but be careful not to add anything too sharp. Life expectancy is strong as the material is durable silicone so it will last you with good care. Great questions! Over time sharper finger nails will damage the silicone, but I have found in my use of the product that using my knuckles works better to seal it. By using the top sections of your fingers, knuckles curved, you are able to get a rounded shape with your hand giving you a better shape and more surface area to push down with. Which will result in a better seal. Do keep in mind, if you have any sharp edged rings, such as a diamond on a wedding ring, this can damage the silicone. So make sure you only use the top 2 sections of your fingers. The EZ Seal is a strong item and if taken care of and it can last a number of years. I believe for one of Silicone Zone's tests the EZ Seal lasted about 5 years. Like I said, the EZ Seal is a strong item and you can stack items on top of it. However, you will want to be careful as to what you are stacking on it, such as anything with a corner and/or with a higher weight can damage by over stretching and weaken or put a whole in the silicone. If you were to put small bowls or fruit like apples, bananas, oranges, etc. would work great! I went to the Silicone Zone website and there are tons of things I would like for my new kitchen. Where do I find them??? Since Silicone Zone just started shipping in the US again this past September we are still growing the number of stores we are in. Right now we are only featuring EZ Seal on Daily Grommet but we'll let you know if that changes. I would never want big ones; will you have a set of 6 inch ones? At this time they are only available in the set of 3 and the different sizes. In the future we may have individuals available for sale, but for now you may be pleasantly surprised as to find a use for the larger size. Sounds like a great product. When you start making it in the USA let me know and I will be first in line to buy. The seal will only create a partial vacuum, correct? Therefore it will not add to the shelf life of anything stored in the container, correct? Might be something worthwhile but very pricey in my book. Good luck though. This is an important question and I know that Robert will be back on tomorrow morning to answer thoroughly. However, I can tell you that it provides a tight seal, yet still has air inside container with food, so it functions the same way tupperware or saran wrap would function. I know the price may seem high, but the quality is higher than any similar product you'll find on the market. Thanks again for your interest and support. Is anyioe else having a problem playing the video demo? When I press "play", the video will will start but freeze at 32 seconds in. I tried to advance the film by dragging the small button forward, but the vidoe freezes again, the YouTube logo appears in the upper right hand corner of the video screen, the screen goes black and a sentnence "This video is unavailable" displays. Perhaps it's my computer. @Marlene Johnson Any luck today? We find these issues of a video freezing or being unavailable usually have to do with the speed of your own internet service....frustrating, I know. But we still appreciate when people flag this. Especially right after our 12 noon launch, things can go a little crazy. We are really human beings pushing buttons to launch each Grommet video and sometimes we slip up on something--if we have a wrong setting etc. They really look like a good idea but seem a little pricey, especially with shipping. I would be interested if they go on sale and shipped free. @ KG I totally agree with KG that these are pretty pricey. I was expecting more in the $10 range. I would really like to order if they lower the price. Hi KG and triciatb. First want to make sure it's clear on our site that this price is $22.00 for a set of 3 covers of varying sizes. That actually hovers around the $7 range for each. The japanese silicone has a higher rating than European grade and then even grater than USA grade. As Robert said above, this can cause pricing to be a little bit higher, but you are paying for quality, product life span, and a much safer quality silicone than other cheaper imitations. Plus, you'll be saving money in the long term by reducing your need to continually purchase more saran wrap and tinfoil to cover leftovers. @Amy Both you & Robert misspelled 'greater' in the sentence "..even grater than USA grade". A grater is a kitchen utensil used to grate food,such as cheese,into fine pieces. will it work on melamine bowls? As long as you're able to create a suction between the bowl and the seal, it will work. Robert will likely be able to jump in here with more specifics. I saw a very similar (or maybe the actual) product on "Shark Tank" and I was SO SO SO impressed! Is this it? I need this product, STAT. Am I overlooking the pricing?? Leftovers never looked so good. 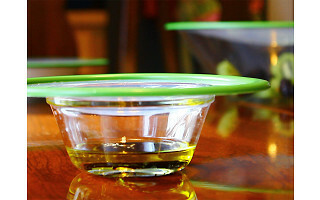 With EZ Seal reusable silicone lids, you can create an airtight seal on any bowl, container or pot. The see-through covers make it easy to identify what’s inside your containers, and they eliminate having to fuss with unwieldy plastic wrap or aluminum foil. With EZ Seal lids, you can store and reheat leftovers in the same dish you used to prepare a meal. The silicone lids also make it convenient to prep a recipe ahead of time and store it in the same container you intend to use for serving. The creator of EZ Seal is Silicone Zone, an innovative product design company that uses modern forms and advanced materials to solve everyday kitchen conundrums. Their EZ Seal covers are designed to work like suction cups to create vacuum seals with superior spillage protection. Simply place one on top of a bowl or pot—they fit most glass or metal containers—and firmly press the center to lock the lid in place.